Your Performa piece at the Studio Museum in Harlem, "Untitled" (2012), is also part of the museum's exhibition "Radical Presence: Black Performance in Contemporary Art," up throguh March 9. The show brings some much-needed attention to black artists that have worked in performance. How do you feel about being included in that show? I think it goes without saying that it's an honor to be in a show with so many amazing artists. I admire a lot of these artists and learned about many of them as an undergrad at UCLA. You and Senga Nengudi, who's also in the Studio Museum show, were paired for your Performa project. Are you collaborating with her or is your work being presented in conversation? We are not collaborating, but I think our work in the [Studio Museum] exhibition is in conversation, for sure. 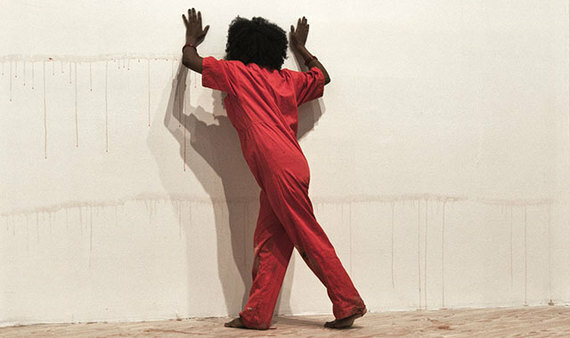 Your performance at the Studio Museum in Harlem involves you cutting your tongue with a knife and dragging it along the gallery wall to form a painting-like streak. Is that an extremely painful endeavor? Response A: One should not believe everything they hear, read, or see. Response B: I go hard in the paint! Response C: I think every good artist has bled literally or metaphorically at some point for his or her art. Performa 13, of course! 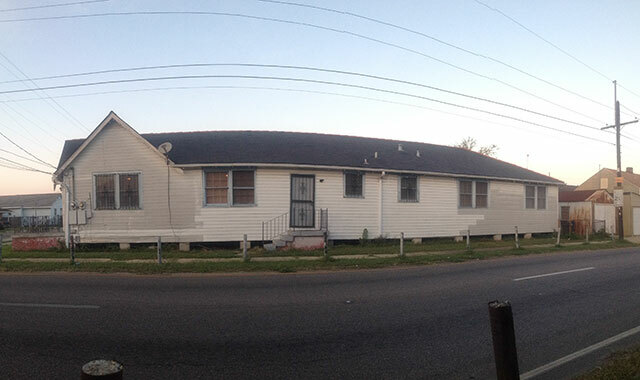 [Also] working on a feature length film/installation with artist Garrett Bradley, which is my proposal for The Prospect 3 Biennial, in New Orleans, curated by Franklin Sirmans. Working on an EP (about four songs of all original music), which will be the soundtrack for the film. A solo show of paintings at Ronchini Gallery in London in February 2014. Preparing for a show at my gallery, Lombard Freid, NYC. Writing (for the past six months) the first 100 pages of what will become a book of some sort. What's the last show that you saw? Buku Broux playing at Bacchanal in the Bywater, New Orleans, over a glass of sparkling and Chocolate Bark with sea salt and olive oil. What's the last show that surprised you? Why? Answer A: A Big Freedia and Katey Red show at Siberia on St. Claude in New Orleans. Achieved the second greatest moment of my life -- a sissy bounce dancer pulled me up on stage to dance. If you know "bounce night," you KNOW that's a big deal cuz you only get on stage if that twerk is authentic. That surprised me! Answer B: Chris Martin's show "Staring into the Sun," at Kunsthalle, Dusseldorf, Germany, 2011. Why? Because I'm still thinking about it. Answer C: Terry Adkins' "Recital" at the Block Museum, 2013. Why? Because of the exquisite use of material. Describe a typical day in your life as an artist. Wake up to roosters in a yard a few houses down, make coffee, drink water, walk to the far end of the house where my studio is, e-mail, pace the studio floor with coffee and e-mails, some form of personal hygiene (depending on the day of the week), teach as a professor at Dillard and Xavier Universities. 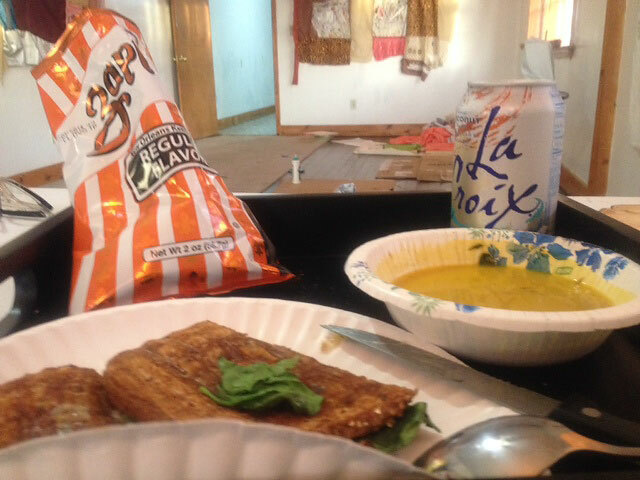 Back in the studio, pace around, make some moves, eat (lately it's been grilled cheese with spinach, soup, Zapp's Regular Flavor (potato chips), and a coconut Lacroix water). Check Internet news, attend Skype meetings, call Grandma, FB/Instagram, think of random but important things for my assistant to do while I jog or do yoga; do focused research, tangential research, late-night moves in the studio with Netflix or Pandora, the boo, Assam tea, repeat. I plead the fif. 1, 2, 3, 4, Fif! The second most indispensable item in my studio is a ladder. The streets, the museum walls, my students, the Internet, nature, from what critics/ fans/ ma haterz say, music, family, old journals and notes from over the years, my dreams. I don't have one song. I sing karaoke all the time to instrumental tracks on YouTube in the studio. Some of my favorites are Lil Wayne, Fleetwood Mac, and Amy Winehouse. I think my song might be "Dirty Diana" by Michael Jackson. An abstract aerosol-painting on cardboard that I painted live at Venice Art Walk, Los Angeles; to an enthusiastic, generous, belligerent hobo named Joe, who really wanted the painting and thought it was " far out." He gave me $5 and a 40-ounce Miller High Life. What's the weirdest thing you ever saw happen in a museum or gallery? Someone who goes to the museum with a camera around their neck and only looks at the art through the lens of their camera. Ewwww. That bothers me. Well, I guess the weirdest thing I've ever seen is also my pet peeve. In Los Angeles: Merkato in Little Ethiopia, India Sweets & Spices, [restaurant in the Hare] Krishna temple in Culver City. In New York: Café Noir in SoHo, Manna's in Harlem. In New Orleans: Booty's Street Food, The Country Club, soul-food food trucks, buffet sushi in the Chalmette shopping center, Shake Sugary. Whenever I travel I try to go to at least 2-3 museums/ galleries. I was recently in London and went to the Tate Modern and Sotheby's for the first time. Fantastically and amazingly nauseating. I don't read books. I own many, though, and still buy them. I mostly read on screens of electric devices. Put myself in a time capsule? Any "all expenses paid" invitations. I certainly think I count as an underappreciated artist. There are way too many living artists whose work I love. I get the added bonus of personally knowing, liking, and loving a handful of them. Katherine Bradford and Wangechi Mutu are two of my favorite living artists. Shamelessly trolling OkCupid, working in my studio, dusting off the altar, singing songs I've written while brushing my teeth, booing up, dodging paparazzi, creating better studio practices such as occasional eating and sleeping, colonics, gingersnaps, and taking it to the bridge.